The 19th September saw UCU launch a major report on how to challenge and improve the HE sector’s record on race equality. 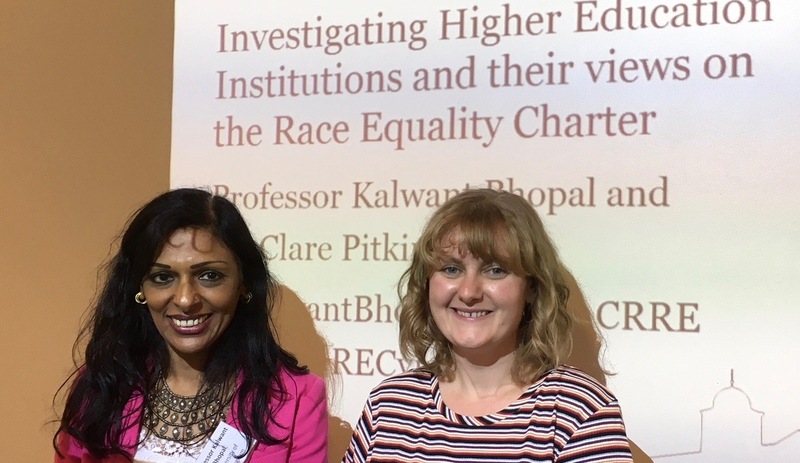 Co-authored by Kalwant Bhopal and Clare Pitkin of Birmingham university it analyses the real impact that engaging with the Race Equality Charter promoted by AdvanceHE, formerly the Equality Challenge Unit, could have, if resourced adequately and handled robustly. The report, downloadable here outlines the findings of a unique investigation into how the Race Equality Charter Mark (REC) impacts on quality policy and inclusion in Higher Education in England. Despite being restricted to England, the findings of the report can undoubtedly have wide implications for HEIs elsewhere in the UK. Based on 45 in-depth interviews with individuals with a wide range of roles working in HEIs, some of which have achieved the charter mark and some which are only considering applying, or are in the process of doing so, the report has a number of key findings worth discussing widely. In addition to this, the interview extracts provided, give an invaluable insight into the realities of of trying to move towards achieving a charter mark for race equality. Amongst the findings are that access to resources such as dedicated staff to work in this area, can be key in whether the process is taken seriously or even gets underway; investment from senior management is key in highlighting the importance of work in this area; a clear focus could be provided by the process if undertaken correctly; addressing the BME attainment gap and understanding the lived experiences of BME students was a key undertaking for success as was investigation of the recruitment, retention and progression of BME staff. The final two findings were the need for the charter to be linked to cultural and behavioural change and that steps needed taken to address the ‘fear of race’ as an area for discussion. Amongst the key recommendations are that achievement of the REC should be linked to UKRI funding in the same way as applications in the biomedical area are expected to have achieved a silver Athena Swan award. Mandatory unconscious bias training for all senior staff in HEIs is recommended (but importantly – not as a ‘sop’ for the real challenging of attitudes) as is the finding that HEIs should have a member of senior staff championing Equality and Diversity whose role would be separate and different from that of Equality and Diversity officers. The role of annual reviews and monitoring also features heavily in the recommendations together with improving professional development for BME staff and the phasing-in of applications for the different levels of the charter mark. Finally, and importantly HEIs are recommended to encourage and develop safe environments to discuss racism something which links in with the theme of addressing the fear of race, mentioned above. A strength of the report is the wide range of interviews with individuals involved in the process of achieving the REC mark, or who are involved in the consideration of future work towards it. Some of the extracts given below will ring true with UCU members all over the UK. The report strongly argued the need to find a safe space to discuss issues of race openly: Many respondents from BME backgrounds mentioned that they felt the REC would enable individuals to discuss issues of race and racism openly. A culture which encouraged a ‘fear of race’ was paramount in HEIs and discussing race was seen as a taboo subject. Hmm. For me this shows the report is spot on, and deserves not just wide dissemination and discussion, but also to be acted on by our members throughout the whole of the sector.